The highway department is replacing a bridge on SR 19 in Mentone. 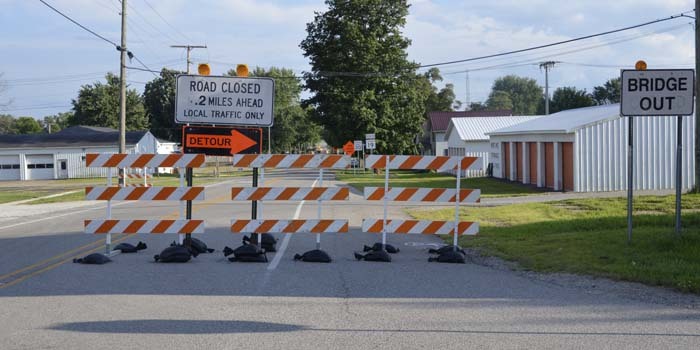 MENTONE — Mentone Utilities Superintendent Josh Shepherd discussed detour issues related to the bridge repair and road closure on SR 19 at the Mentone town council meeting Monday, August 7. Shepherd said the highway department is replacing the bridge on SR 19 so a portion of the road is barricaded. According to Shepherd, there is a bridge from the old cemetery in Mentone that crosses into the new cemetery and comes out on the other side of 19. However, that bridge is old and will not handle a lot of traffic so the town has closed the gate off of SR 19 leading into the new cemetery. According to Shepherd, he initially put up a “Road Closed” sign at the cemetery. When people continued to drive through the cemetery, Shepherd drove fence posts into the ground to block that area off. The issue now is that people are actually pulling the fence posts out in order to drive through. Council member Tim Croy advised that If people want to come to the cemetery, they are still able to get in through the entrance at the old cemetery. Council members said signs had been placed in advance to inform people about the bridge work and detour. Shepherd also informed council members that he had received two quotes for paving work on Morgan Street. The quotes were from Michael’s Asphalt Paving, Warsaw, and E & B Paving Inc., Rochester. A motion was made to award the bid to E & B Paving Inc. This motion was approved. After the July town council meeting, a budget workshop was held where proposed budgets were discussed. At last night’s meeting, Mentone Clerk-Treasurer Barb Ross informed council members that cuts would need to be made in two areas of the proposed budget. Ross provided a budget breakdown, and council members agreed to the changes. Council members discussed issues with a property located at 301 South Oak St. in Mentone. They have received several complaints regarding the appearance of this property mainly due to the yard not being mowed on a regular basis. Mentone Town Marshal Jim Eads is making efforts to contact the homeowner. Eads discussed a lightning strike to the Mentone Fire Department & Town Hall building that occurred approximately two to three weeks ago which did a significant amount of damage to the EMS, Fire and Police Department equipment. Damaged items include the new tornado siren, several televisions, a base radio, router, cell phone and a video camera system. Damages total approximately $5,000 to police department equipment and approximately $10,000 to fire department equipment. Eads said they have been in contact with the insurance company and will begin replacing the damaged equipment. Housing Opportunities of Warsaw will be at the Mentone Fire Department & Town Hall at 5:30 p.m. Sept. 14 to present a home energy impact program, which is available to everyone. Homeowners who attend the program will receive free air sealing products, including a caulk gun and caulk, a window kit for six windows, LED bulbs, spray foam insulation and more. Council member Tim Croy said sign up sheets are available at Java Jacks and in the clerk-treasurer’s office or residents can contact Croy directly. The next regular meeting will be held at 6:30 p.m. Monday, Sept. 11.